On my way to a meeting today I sketched this woman who decided to take two seats for herself and her bag while other people were standing around her. It's interesting to see how people react as they got in the train. Most would change direction and try to find another seat or stand somewhere else. This one man stood right in front of her but didn't do anything. I wonder what was going through her mind. Perhaps she didn't realize it but she was a little fidgety and kept replacing her hair behind her bandana while focusing on her ipad. Meanwhile next to her, a lady moved to another seat to let a mom and her two kids sit together. On the way back from my meeting, I tried people perspective with the row of people sitting in front of me. As I get faster at drawing people on the subway, I get a chance to try different compositions. It's a lot easier with a mini sketchbook. The one I currently carry with me all the time is approximately 4 x 3 inches. 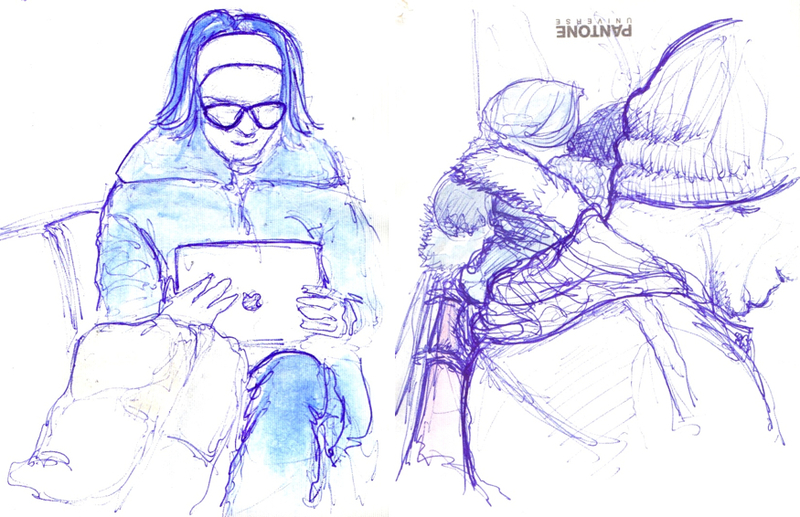 Wonderful sketch, you capture the moment well with her pose and the other passengers too. Bravo!